Our garage was constructed completely with out roof or eave vents, which means it gets very warm in there on hot days. In the evening we try to remember to open up the doors to let the heat out. We feel it does not help keep our house cool to have a big box of hot air attached ti it. Yesterday was a particularly hot day, and when Hubby and I got home from a wedding about 9:30 pm we opened up the big and the side doors to let the heat out. We then took our sweaty selves (it was an outdoor wedding) and collapsed under blessed air conditioning in front of the TV. The fact that the AC was running probably explains why we didn’t hear what was going on in our garage. Unbeknownst to us, we had a visitor. When the girls got home from the same wedding about 11:30 pm, they let us know that Youngest Daughter had just chased a raccoon out of the garage. So Hubby and I ran out to close the garage door before it could get back in. 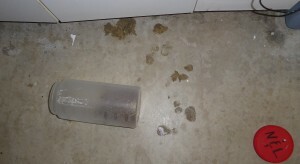 I was the first into the garage, and saw what the raccoon had been up to. It had knocked the cat food container off onto the floor, got the lid off, and had a nice little late evening snack. Even more annoying, it had washed its little dirty feet off in the kitty cat’s water fountain (because Lumos loved running water) leaving it a mucky mess and leaving muddy footprints all over the counter. 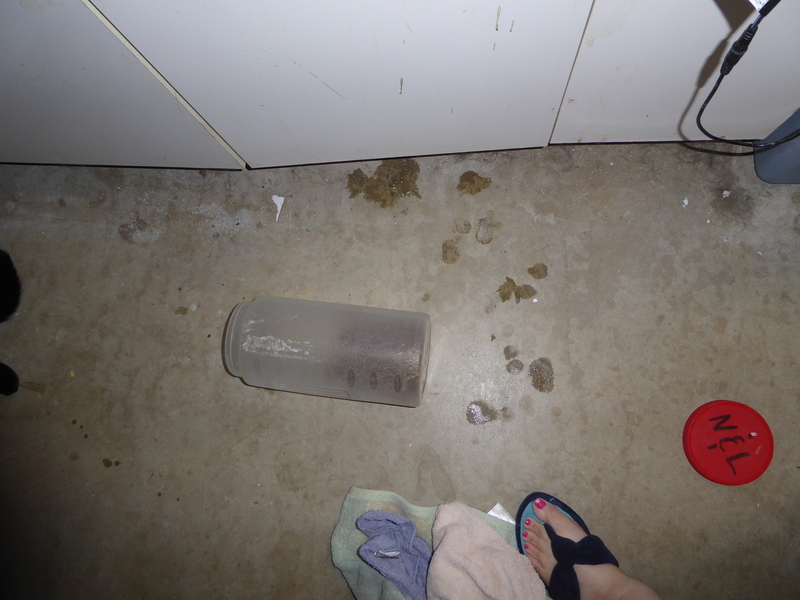 Wet footprints and an open cat food container. 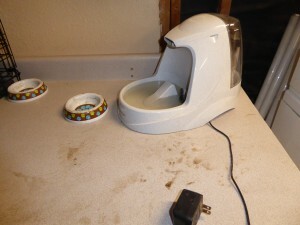 Muddy footprints and dirty water in the cat fountain. We have been considering getting a security/screen door for the side door of the garage, just because it would allow us to air out the garage without worrying about Lumos or Nox rushing out to the garage and getting out when we are doing the airing out. But, having had such a rude visitor last night, Hubby has now put that to the top of the priority list. And, if any one can tell me, why are raccoon’s feet so dirty? Wherever a raccoon and water come together, they leave muddy footprints, at least around our house!